Toowoomba Central Plaza Apartment Hotel is perfectly positioned in the heart of the Central Business District. The hotel offers studio, one, two and three bedroom apartment suites and penthouses. Enjoy the heated pool and spa, gym, barbecue area, conference facilities and day spa. All guests enjoy free: continental breakfast, WiFi, Foxtel and secure undercover parking. Toowoomba Central Plaza now features the Tom Collins Bar on the ground floor of the hotel. There are a wide range of quality restaurants and night spots also within walking distance to the hotel. The famous Empire Theatre, located one street back from the Hotel, houses some of Australia’s great shows and artists. 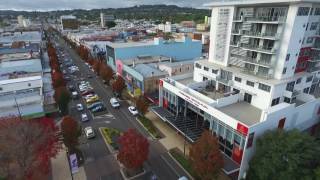 Toowoomba also has many magnificent shopping outlets with The Grand Central shopping centre which houses a huge variety of name brand shops and also Garden City shopping centre. All guests enjoy free: continental breakfast, WiFi, Foxtel and secure undercover parking. Studio style apartment with Queen size bed or Twin singles, bathroom and kitchenette. Two bedroom / two bathroom apartment with large dining and living area, large entertainer balcony and fully equipped kitchen and laundry. Large three bedroom apartment featuring three Queen size beds with two bathrooms, fully equipped kitchen and laundry, separate dining area and entertainer balcony with views looking out to the city and tree-lined hills. Luxury three bedroom penthouse with sweeping views of the city and tree-lined hills. Featuring three Queen sized beds, large entertainer balcony and fully equipped kitchen and laundry.